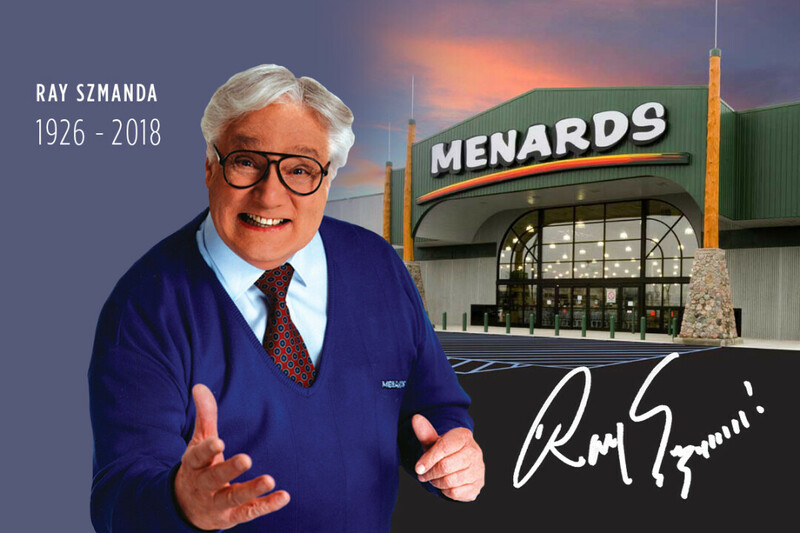 Today the news is spreading that Ray Szmanda, the Midwest-famous “Menards Guy,” a multi-decade TV commercial pitchman for everything from paint to faucets to lumber, passed away May 6 at the age of 91. 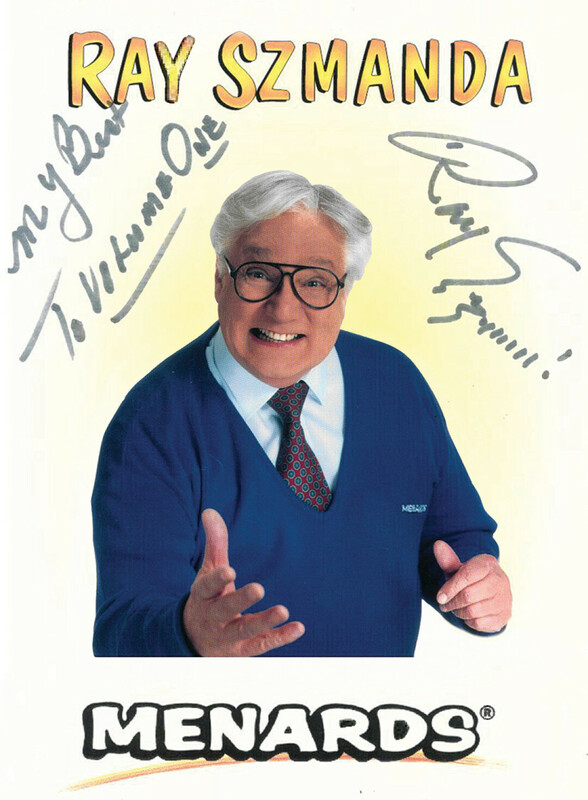 For nearly 25 years a growing radius of TV viewers were introduced to his signature black glasses/blue sweater combo, his giant grin, and his seemingly relentless enthusiasm for home improvement. Ray started the gig way back in 1976, three years before I was even born. But by the time I was about 20 and starting a stint at the Menards general office making TV commercials, Ray was still there plugging away at those cue cards, letting a huge chunk of America know exactly what was on sale that week with a pocketful of puns at the ready. Even in his later years (he was in his mid-70s by the time I worked with him) he had a booming voice that would echo throughout the aisles of the Westside Menards, commanding attention from unsuspecting shoppers. For about a year, every Friday I got to work alongside Ray as we shot the opener, closer, and narration of anywhere from eight to 10 commercials. That’s a lot to shoot, and we needed to hustle to get it all done. We’d sometimes be in the studio or on location, but oftentimes we’d be right out in the open in the store during regular business hours. And of course it was in the store where he’d turn heads. Even in his later years (he was in his mid-70s by the time I worked with him) he had a booming voice that would echo throughout the aisles of the westside Eau Claire Menards, commanding attention from unsuspecting shoppers. We’d be tucked away in the paint aisle with lights, cameras, and microphones and as soon as he started in on the script at full volume, the rubbernecking from customers would be hilarious. He was a legit celebrity. 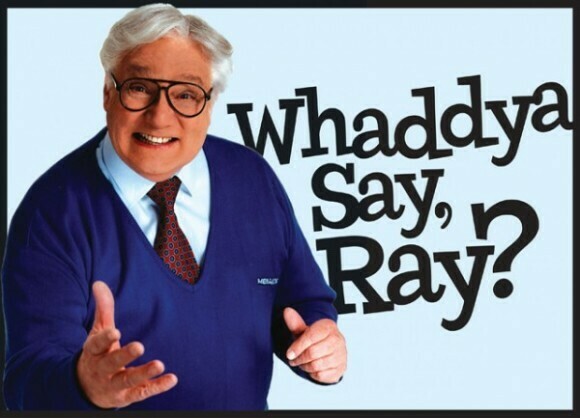 Imagine for years hearing Ray’s voice on TV selling you carpet and yard supplies and then suddenly you’re actually in Menards and you hear him in real life in the aisle behind you. People were in shock. And he loved every minute of it – waving hello, shaking hands, and giving the people what they wanted with a boisterous “Save Big Money!” on command. It was as much fun as I’ve ever had at a job. After a morning of shooting we’d break production and he’d invite us all out for lunch together, often at a pizza buffet. At lunch he wouldn’t remove his blue shirt, nametag, or his signature black glasses (which didn’t even have lenses in them due to the glare on camera). Needless to say he stuck out like a sore thumb to anyone who’d ever watched television across the Midwest over the previous 20 years. Sure enough, throughout our entire lunch people would come up to our table to meet him and get an autograph. That’s when – happy as can be at their request – he’d pop open his briefcase packed full of headshots, ready for personalization to his many fans. He loved it, and so did we. 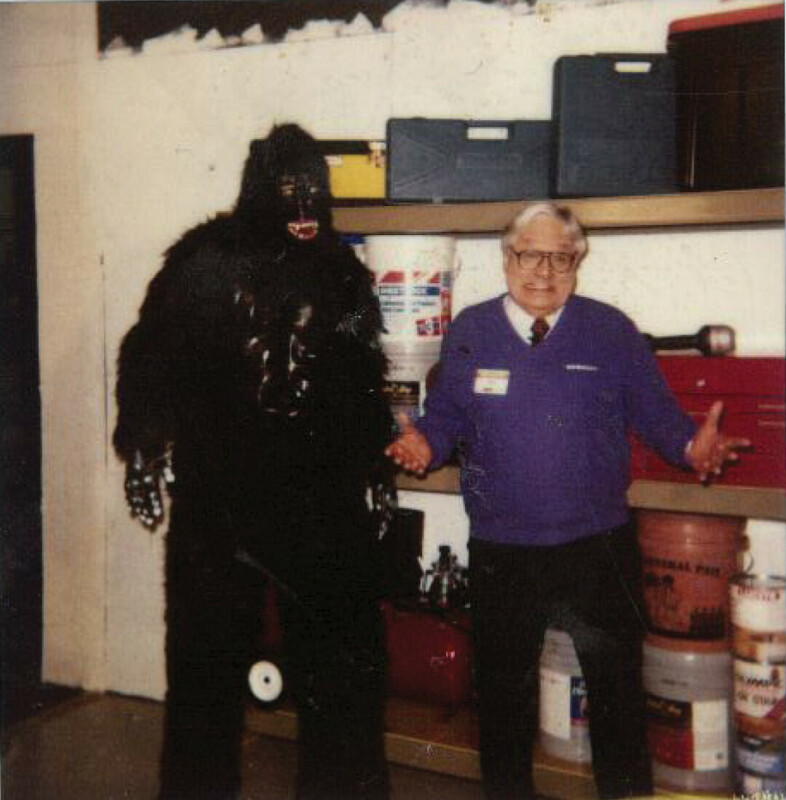 Ray Szmanda on set at a Menards commercial shoot for Gorilla Rack Shelving, circa 2001. Volume One owner/publisher Nick Meyer is the guy in the gorilla suit – it was his job to jump into the frame, hop up and down, and pound his chest. Ray had plenty of monkey jokes for the crew. To celebrate this Midwestern cultural icon, we’ve gathered up some photos, videos, and tidbits here to share (see below), including a great interview Volume One had with him roughly nine years ago. He truly was a kind and generous man. Please, comment below with your stories and memories too. I will fondly remember Ray, and I know so many who had a chance to work with him will too, not to mention the millions who saw him grinning on TV, paintbrush in hand. Back in 2009, Volume One published a long Q&A between Ray Szmanda and former managing editor Trevor Kupfer. They covered a lot of fascinating ground, including his other gigs, how he got the Menards job, and funny things that happened while filming commercials. Volume One: I also heard that you’re a drummer, as well. Is that right? Ray Szmanda: Yes. I was a professional drummer. I played on the road. 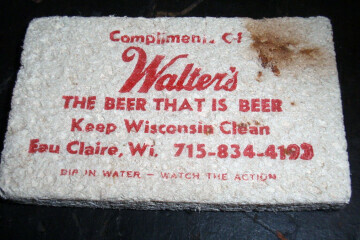 This is when I was young. Right when I got out of the Navy at 21. I had my own trio. We played 40s music, what we called swing. Swing lasted about 10 years, and then of course rock ‘n roll came in. The Found Footage Festival – a local favorite – puts together touring comedy shows based on old VHS video footage from just about anywhere, from corporate training videos to infomercials. And The Menards Guy is no exception. Check out one of their favorite clips. On May 12, 1997, the Chicago Tribune ran a great article on The Menards Guy. This was while Szmanda was still working for the company in full force. The Menards Guy is the chain's only spokesman and has been for 20 years. But for some reason--he says he has no idea why--in the past two years or so he's become a bit of a cult figure, a pop icon to whom viewers write fan letters and request autographed photos. The mail comes to the chain's Eau Claire, Wis., headquarters addressed to "The Menards Guy," or, more formally, "The Menards Man." In his hometown of Antigo, Wis.--population 8,500--postal workers and others call his wife "Mrs. Menard." Ray was known to carry around a briefcase full of head shots because so many people would ask for his autograph. Volume One scored one. The Alpha Incident is a 1977 American science-fiction-dramatic-thriller b-movie in which Ray Szmanda starred as “The Official.” Check out a compilation of Ray’s scenes. Check out a short series of bloopers with Ray Szmanda as he shot commercials for Menards here in Eau Claire. Svengoolie is a hosted horror movie show. The show's title is taken from the name of the character host. It's a long-running local program in the Chicago area and in recent years it's expanded nationally, airing Saturday nights on MeTV. Watch one of the old show’s parody commercials. Enjoy a trippy tribute to The Menards Guy called "THE MENARDS MAN REMIX."